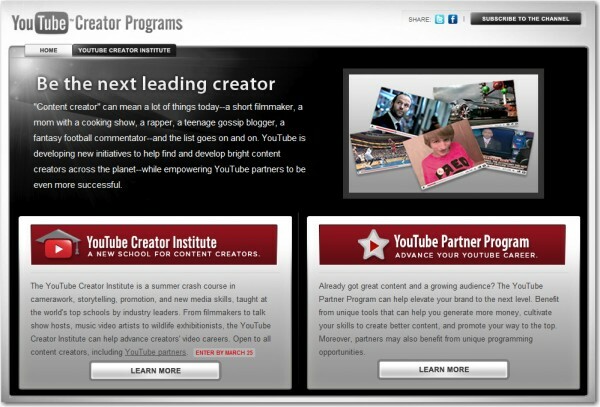 Be the Next YouTube Sensation With YouTube Creator Institute! Want to develop digital media skills and launch your career as a YouTube celeb? Now’s your chance! YouTube has created the YouTube Creator Institute, in partnership with the University of Southern California School of Cinematic Arts, and Columbia College of Chicago. Students at the two schools will have the opportunity to participate in a series of media programs – with applications being accepted nationwide through March 25. Earn a paid YouTube Creator Institute experience at a leading institution. Learn broad new media skills and use unique creator tools. Get promotional opportunities and build global audiences. Engage with world-class faculty, industry leaders, and top YouTube stars. Both schools will only select 10 students to take the class. The USC program runs from May 25 through June 2, while the Columbia College program runs May 31 through July 22. The YouTube community will select the top applicants via a two-week online voting period between March 28 and April 8. The two colleges will then narrow those down – announcing the final list on April 20. In order to apply, students will be expected to answer two questions and provide a two-minute demonstration of their craft.